Dancing on bar tops and rock and roll music might not sound all that luxurious but here at luxury-travels.net it’s not all about 5 star hotels but also 5 star experiences as well. Hogs and heifers bar in the meat-packing district in New York offers an experience you will never forget. First tip though, leave your glitzy dress and Prada bag in the hotel for this one, tonight you’ll be slumming it. 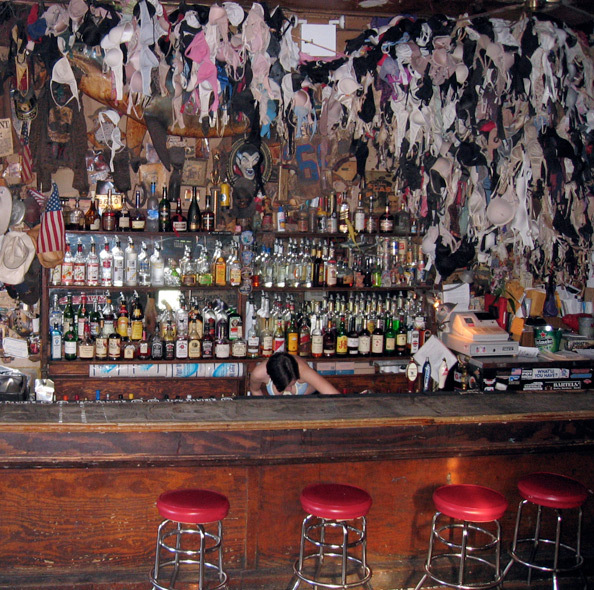 Inside hundreds if not thousands of bra’s hand from the ceiling and a small selection of red leather bar stools line the bar. These stools are so much for sitting on but more to help the adventurous ones among us get on the bar and shake their funky stuff. The atmosphere is everything you might expect from a beer swilling, bar top dancing, biker bar; it’s all high spirits, singing, shouting and general frivolities. The best thing though is how little ‘judging’ goes on. I saw leather clad bearded bikers arm in arm with the suited and booted of the financial district. If you know the words to a few of the rock classics you will be welcomed with open arms. The bar staff are full of energy and ooze a theatrical hardness as they joke and flirt with some patrons whilst insulting and mocking others. It’s hard not to get caught up in all of excitement and I found myself doing a slammer of some sorts with one of the bar staff (despite not even ordering one). The bar is not just for drinking at however as both employee and patron periodically get up onto the bar and (sometimes seductively) shake their money makers to the power of the rock ballads. If you ever saw the film Coyote Ugly then you will have some idea of what to expect. It’s a great night out and one of those experiences you are not likely to forget in a hurry. So if you want to see the underbelly of New York City culture I would thoroughly recommend a visit to Hogs and Heifers in the Meat Packing District.